Actresses Lori Loughlin (left) and Felicity Huffman appeared in federal court in Boston on Wednesday along with a group of other parents. A total of 50 people have been charged in connection with the alleged years-long scam. Neither woman entered a plea during what was a brief appearance, reports Kirk Carapezza of member station WGBH. As the hearing got underway, he adds, Loughlin smiled as she shook hands with federal prosecutors. Eleven other wealthy parents allegedly involved in the scheme were also scheduled to appear at the same session, including Loughlin's husband, fashion designer Mossimo Giannulli. 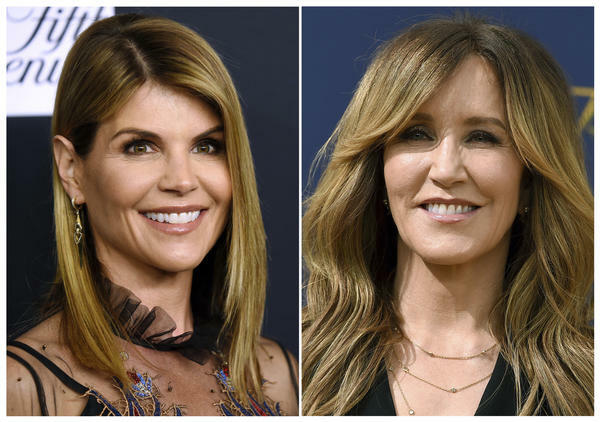 The two actresses are the most high-profile faces of the admissions scandal, in which parents allegedly paid millions of dollars to have their children's test scores and athletic achievements falsified to get them into elite colleges such as Yale University and the University of Southern California. Huffman is best known for her role in the dark comedy series Desperate Housewives, while Loughlin starred in the family comedy Full House. The 13 parents in court Wednesday are among a total of 33 parents accused of participating in the scheme — all of them charged with conspiracy to commit mail and honest services mail fraud. None of their children has been charged. Neither Loughlin nor Huffman has publicly discussed the allegations since the charges were announced on March 12. Perry Viscounty, a lawyer for Loughlin and Giannulli, told NPR that his clients will not be making any comments outside the Boston courtroom. Huffman's lawyers did not immediately respond to NPR's request for comment. Huffman was arrested March 12 and released on $250,000 bond on condition that she surrender her passport. Her husband, actor William H. Macy, has not been charged. Loughlin was arrested and released the following day; her bail was set at $1 million, and her travel was restricted to the continental U.S. and British Columbia. "If convicted, Loughlin, Huffman [and] Giannulli ... could face a maximum of 20 years in federal prison and a $250,000 fine, though they could receive shorter sentences as first-time offenders," Carapezza reports. Federal authorities have charged 50 people for alleged roles in the fraud that, according to court records, lasted from 2011 through February 2019. The man at the center of the scandal, Rick Singer, has pleaded guilty and has been cooperating with authorities since late 2018, according to court records. In documents stretching more than 250 pages, federal authorities detailed the scheme in which, they said, parents paid vast sums to have Singer and his associates falsify their children's standardized tests scores or bribe coaches to have their children designated as athletic recruits. The parents paid some $25 million, which was used to bribe coaches and administrators over the course of the scam, according to the prosecutors. Loughlin and her husband are accused of paying $500,000 to ensure that their two daughters were designated as crew recruits to the University of Southern California. The daughters did not row competitively, but the family allegedly supplied photos of both working out on ergometers. Huffman allegedly paid a comparatively smaller amount, $15,000, to boost her daughter's SAT score. According to court documents, an associate of Singer flew across the country to inflate her score — "either by correcting the student's answers after the test or by actively assisting the student during the exam." Among the 50 people accused are nine college coaches and a university administrator. Stanford University's former sailing coach, John Vandemoer, and Yale's former women's soccer coach have pleaded guilty, while many of the other coaches have pleaded not guilty. Since prosecutors announced charges against Loughlin, she and her daughter Olivia Jade Giannulli have lost business deals. The Hallmark Channel swiftly cut ties with Loughlin, who starred in the series When Calls the Heart, after the charges were announced. "We are saddened by the recent news surrounding the college admissions allegations," Hallmark's parent company, Crown Media Family Networks, said, according to The Hollywood Reporter. "We are no longer working with Lori Loughlin and have stopped development of all productions that air on the Crown Media Family Network channels involving Lori Loughlin, including Garage Sale Mysteries, an independent third-party production." Olivia Jade, a beauty vlogger with nearly 2 million subscribers, has lost deals with Sephora and TRESemmé.